Improbable as it may seem, 'Singular Forms (Sometimes Repeated)' is Sylvain Chauveau's first album of new material in five years, and if you've ever found yourself marvelling at the music of David Sylvian, or indeed the solo work of Martin Gore - this album will blow your mind, referencing both artists combined with a stripped Piano/Electronic arrangement reminiscent of Alva Noto's work with Ryuichi Sakamoto. Since 2005's 'Down To The Bone' was released we do seem to have been drip-fed a steady supply of Sylvain's work thanks to Type's reissue policy, culminating last year with the reappearance last year of his 'On' collaboration with Steven Hess and Deathprod, 'Your Naked Ghost Comes Back At Night'. Given what we've heard from Chauveau in the interim, it might be easy to forget that the aforementioned 'Down To The Bone' album was in fact all about songs - specifically the songs of Depeche Mode. On 'Singular Forms', Chauveau presents a collection of his own songwriting, one that's presented stripped of orchestration and the trappings of his contemporary-classical compositions. What's left is piano, some strictly minimal electronics and a free-roaming central vocal. While we're on the subject of vocals, there's really no getting around the David Sylvian comparisons that Chauveau is bound to attract with his fragmented, stately annunciations. But for the occasional reminder of his French accent, Chauveau's delivery is remarkably similar to that of the ex-Japan frontman, and his appetite for abstract, avant-garde re-imaginings of songwriting represents another trait the two artists have in common. A counterpoint between the fractured melodies of those rich, intimately intoned vocals and the aloof soundscape that lies beneath them is what makes this album so special: the delicate web of micro-electronics, high frequency glitches and bare piano keyings work in a similar manner to Alva Noto & Ryuichi Sakamoto's beloved collaborations and when vocals are added to this canvas the likes of 'A Cloud Of Dust' and 'Slowburner (With Stillness)' acquire a remarkable emotional pull. Even during his most esoteric moments, such as the floating, whirring oddness of 'The Unbroken Line', Chauveau elicits outstanding moments of beauty from his tapestry of sine waves, interference and interruptions. 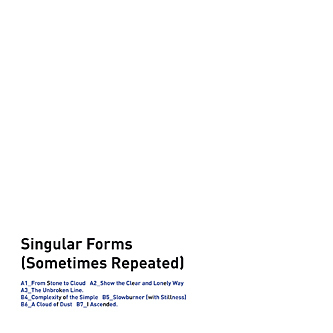 Also worthy of note is the album's structure and sequencing: clocking in at just over half an hour with seven individual pieces, Singular Forms takes care not to overstate its ideas, instead condensing itself into a perfectly formed capsule of experimental song craft that keeps revealing new layers with every listen.